If you were blindfolded on the way to your surprise honeymoon destination – and had knocked back a few too many glasses of fizz, causing you to lose track of the flight time – on arrival at Asia Gardens Hotel & Thai Spa, part of the Barceló group, you'd take a guess that you were in Thailand or Bali. But this exotic resort is a hidden gem for newlyweds close to Alicante, only a short flight away from the UK. I'd recommend experiencing the journey with your eyes open, though, as the private hotel transfer kickstarts your whole stay. From the moment you take a seat in the luxury Lexus, spa music fills your ears and you relax into the honeymoon bubble you'll float around in for the duration of your stay. A 30-minute drive from Alicante airport, we navigated the Spanish motorway and whizzed up into the mountains. Through guarded gates we drove and, ta-dah, we felt like we'd arrived in Asia – welcoming concierges greeted us and our bags were whisked off to our suite. Located on the Mediterranean coast, 150 metres above sea level on the slopes of the Sierra Cortina, which has a mild average temperature of 19 degrees all year round, the hotel combines contemporary luxury with the opulence of bygone Indian and Thai palaces. Subtle eastern scents and soothing sounds transport you into an ultra-calming world where Asia meets the Mediterranean. A short stroll out in the sunshine from the grand reception area, we wandered the pathways of what felt like a village of terracotta buildings, among exotic Asianstyled gardens, where our Suite Deluxe – only one of seven – awaited us on the top floor of one of the blocks. We fell in love with our Balinese-influenced beauty as soon as we entered. It was a peaceful retreat with everything we needed, and more. Luxurious lounge, including plasma TV and Nespresso machine – check. Private balcony where you can dine under the stars – check. 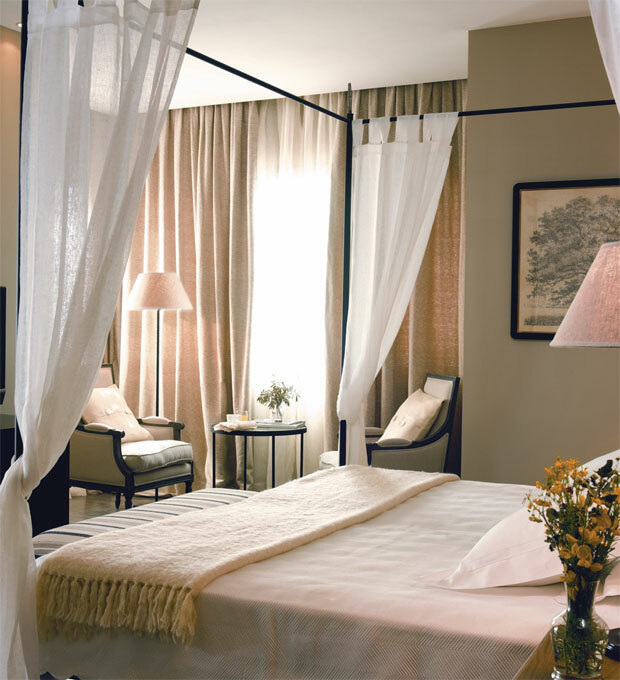 A classy, black four-poster bed laden with crisp white bedding and voile draping – check. And the bathroom didn't disappoint either – his 'n' hers mirrors, a walk-in shower and a low bath with a window that you could swing open to bathe, with the sea view as a backdrop – plus, spa toiletries, robes and slippers. After excitedly exploring every nook and cranny, and star-fishing on the huge bed, of course, we left our suite to check out the hotel's seven pools – tallying up an impressive water surface of 3,500sqm. The main outdoor pool which sits directly behind the hotel, is picturesque in more ways than one. Its impressive multi-level design means water flows from one section to another, including infinity pools, where you can admire breathtaking views of the Costa Blanca. In fact, you can appreciate sea vistas from nearly every outdoor spot, thanks to the hotel's sea-facing mountainside setting. 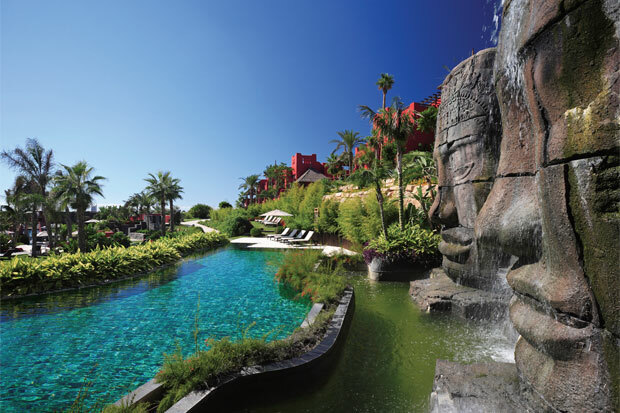 Over 160 different botanical species and rambling cascading water features make it a gorgeous tropical setting in which to soak up the sun and wallow hours away. If you fancy a little extra rest and relaxation, the raised, outside private cabins, with tatamis for traditional Thai massage, can be booked for al fresco spa treatments. After a dip in the Jacuzzi in one of the two heated outdoor pools – Zen and Faces of Angkor – it was time to head back to our suite and indulge in a little pre-dinner pampering before our meal at Koh Samui, the hotel's Thai restaurant. This was first-class fare, traditional dishes made with authentic spices, enjoyed in an ultra romantic, candle-lit setting. My other half has told everyone who will listen about his 'top' lobster curry, and the tempura prawns to start were to die for. Completely satisfied, we strolled back to our suite to find our bedding turned down and a lemongrass scented candle lit by the bath – could we love this place any more? There's a choice of five restaurants at the hotel, offering Asian fusion, Mediterranean and International gourmet cuisine, as well as a trio of bars – the Bonsai, Champagne and Zen Snack – to choose from, each with different vibes and plenty of stylish outdoor seating. For lunch we grazed at the poolside Mediterranean eatery, which had lighter dishes such as salads, calamari and tarts on the menu. Breakfast was served in the buffet restaurant, which, as predicted, was so much more than your standard spread – fruit, cereals, fresh pastries and continental meats and cheeses filled the islands, while omelettes, pancakes and churros were made to order at the show-cooking station – the choices really were endless. Fuelled for a long, tough day of TLC at the Asia Gardens Hotel & Thai Spa, we had some tough decisions to make – just where do we go to read and relax first? One of the stunning outside pools, our oh-so stylish suite or the sensual spa? With a Balinese couples massage booked for the afternoon, we worked our way through each of these spots in the morning, ending up in our robes, sipping complimentary green tea on the double-bed loungers in the hotel's Thai Spa. 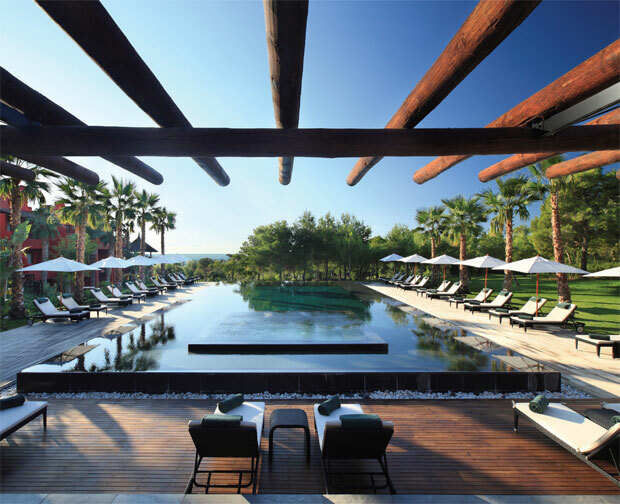 Boasting a heated pool, which flowed from inside the spa to an outside decking area, a Turkish bath, and five massage rooms, it really is impossible to do anything but unwind here. After learning that the spa's massage therapists studied at the Wat Po Temple in Bangkok, where Thai massage techniques were first taught, we knew we were in for a treat. Disposable underwear on – don't ask! – one of our therapists showed us into our instantly-calming treatment room, which was set up for two. We began by sitting back on cushion-clad chairs beside a bath full of water, decorated with floating flowers, and bathed our feet in a wooden bowl of warm water. We smelt a selection of oils before choosing one with a coconut fragrance for our treatment. Feet dried, we each laid on a bed for what turned out to be the most relaxing hour of our lives – when they say whole body, they really do mean it! Post-treatment, we took a few lazy steps from the massage couch to a poolside lounger where we rested for a while longer – it's tiring work. If you do find yourself with some energy to burn, the newly-upgraded and refurbished Fitness Centre is the ideal spot for a workout. Come the evening, we felt like a new couple, so it was the perfect time for a date night – in fact every night's a date night here, as even if you choose not to venture out of your suite one evening, room service means you can enjoy a romantic meal in your robes. We had a table at In Black, the hotel's gourmet restaurant, which certainly enticed our taste buds. Right from the gazpacho entrée, we knew quality was this restaurant's middle name, and the prawn carpaccio, steak and thick cut chips, and piña colada sorbet didn't disappoint. Fizz flowing, we toasted to a truly gorgeous time. From the chocolate caviar served with tea, to the chic ribbon tied to our luggage on departure, luxury comes as standard here. A perfect spot for newlyweds who want some quality time out together – a paradise that's only a hop, skip and short flight away. Fancy venturing beyond the spa?